The aim of this study was to complete an audit on the number of open access journals within the discipline of Exercise Science. Publishing in open access journals results in wide dissemination of material in a very short period of time compared with the more traditional way of publishing in a subscription journal. The 2010 ERA journal list, category Human Movement and Sport Science, was initially utilised and then compared with the openness of the same journals in 2012. In this study journals were audited for their degree of open access, open licensing and open format. Open access relates to the free online availability of research results and hence research publications and in the discipline of exercise science relates to the concept of an idealised level playing field. Open licensing relates to the ability of the consumers to replicate and share those publications freely whilst open format relates to the use of open and transferrable format types. Open access increased (p=0.014) as did our measurement of open licensing (p=0.000) and open formats (p=0.021) between the 2010 and 2012 reviews of the journals in 1106 FOR code. 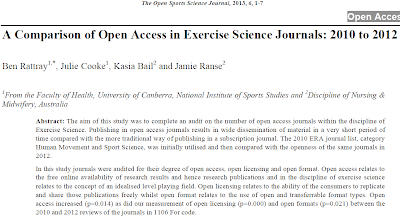 This study reveals an increase in the number of Exercise Science journals that have full or partial open access over the two year period and suggests that authors are increasingly adopting peer reviewed open access journal publications. It is evident from this study that the impact of open access journals be assessed and further research into the feasibility of such a rating is imperative. Rattray B, Cooke J, Bail K, Ranse J. (2013). A Comparison of open access in exercise science journals: 2010 to 2012. 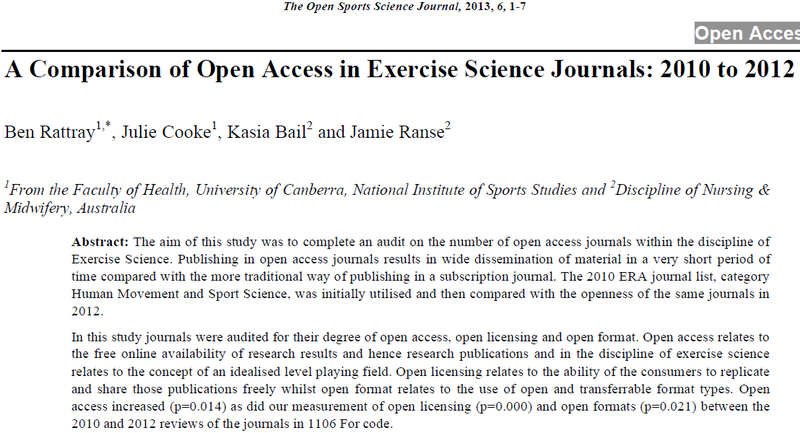 The Open Sports Science Journal. 6:1-7.